Actual Southern California locations where "Back to the Future" was filmed.
.[ Click here for an interactive MAP of all B.T.T.F. locations!]. his electric guitar in Doc Brown's garage/lab. we see what is supposed to be Doc's garage/lab behind him. 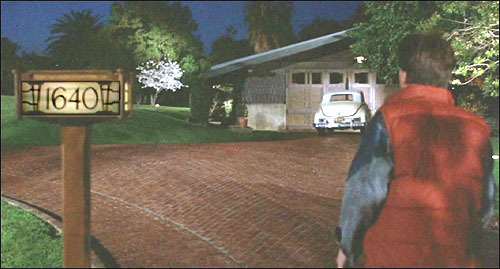 original 1955 home in the movie. Note the center diagonal stripe in the lot in both photos. then hitches a tow off the back of a passing truck. That Burger King was real, and better yet, it's still there! Walt Disney Studios and Warner Bros Studios. they are heading north on Victory Blvd. 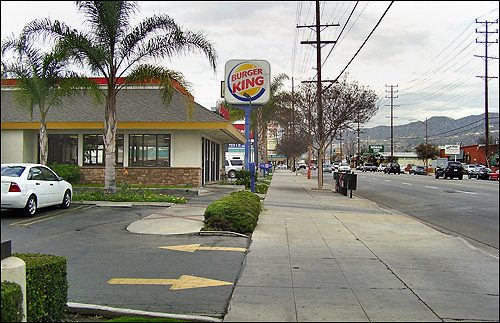 Below is a photo of that same Burger King, in 2009.
as you can see in this Google StreetView. But it's still a Burger King. Victory Blvd is one of the few real streets you'll see in "Back to the Future". a nearby movie studio. That set is now nicknamed "Courthouse Square". The good news is that even though the neighborhood isn't real, you can still visit it! with admission to the Universal Studios Hollywood theme park). and ofen changes its look from production to production. The shot above is of 1985 Hill Valley. Note the smog and duller colors. 1955 Hill Valley, when the town is newer and cleaner. Same set. Note the brighter colors and the blue sky. and its surrounding streets at Universal Studios. Marty then heads to school. 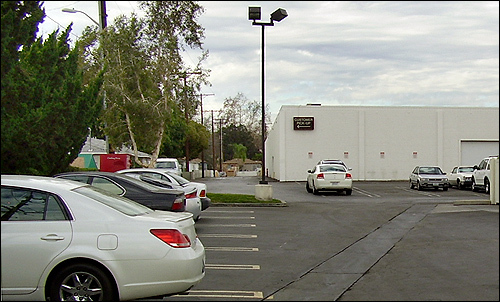 12417 E. Philadelphia St., in Whittier, CA. 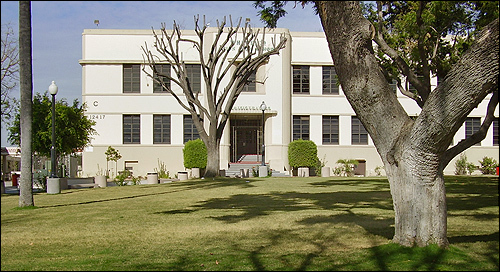 (Whittier may be best known as home to former President Richard Nixon. Here is a Google StreetView of the school today. for a "Battle of the Bands". at 1515 Glenoaks Blvd, in Burbank. More "Back to the Future" Locations! The photos on this page are stills from the DVD of "Back to the Future"